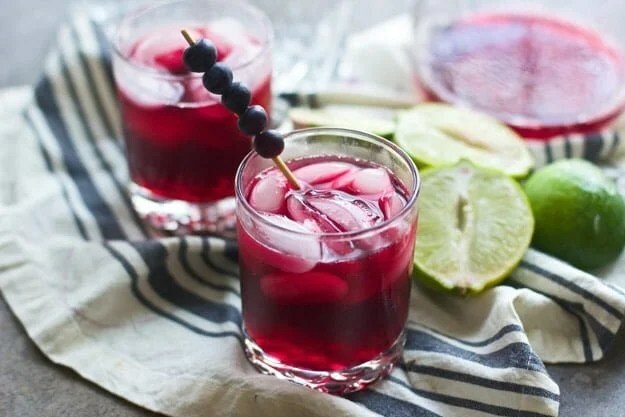 We were at my sister-in-law’s baby shower last weekend and the host made these blueberry basil cocktails and they were amazing! Muddle together 4-6 basil leaves, a handful of blueberries, and juice from 1/2 lemon. Add simple syrup to taste as it will be a little bitter. You can add club soda or Sprite to make it fizzy. You can add gin to make it more of an adult drink too. Combine the lime juice and mint. Muddle together. It’s another edition of Thirsty Thursday! Today we’re talking about one of my old favorites, the French Martini!